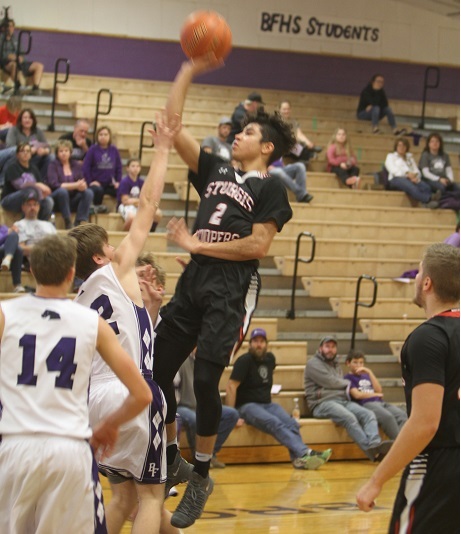 Cedric Stabber heads to the basket Tuesday night in Belle Fourche. BELLE FOURCHE, S.D. - The Sturgis Scooper boys basketball team had a sluggish start in their season opener at Belle Fourche Tuesday night. The Broncs hoped to make things interesting -- down just 3 after one quarter. But the Scoopers settled down, and outscored Belle Fourche 26-10 in the second quarter to blow the game open by halftime. Dawson Geuke picked up right where he left off last year, scoring 17 points and hitting two 3-pointers. Connor Crane also dominated in the paint, scoring 11 points. Ryan Garland canned three trey's en-route to 10 points. Tate Hostetter was the only Bronc player in double-figures, scoring 17 points. Meanwhile, the Belle Fourche girls showed why they are a favorite for state this year. The Lady Broncs outscored Sturgis 15-3 after one quarter, and never looked back, sending the Scooper girls home with an 0-2 recrod after a 58-44 win. Shayla Howell put in a dominating performance, scoring 20 points to lead the Broncs. Mandee Williams was equally as impressive, scoring 17.